Gavel is now enjoying his new position as the Vice-Regal Dog of Queensland. 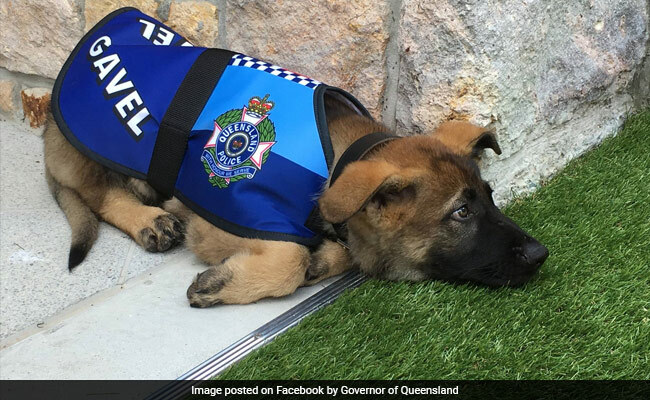 Gavel the German Shepherd pup was sad after he failed the police dog academy in Queensland, Australia, for being too 'sociable.' Instead of crime-fighting aggression, he liked belly rubs and making friends. Even though reports state that he came from a long line of police dogs, a career in fighting crime was just not for him. Luckily for him though, he had friends in high places, for the Governor of Queensland created a new position just for him. He is now Queensland's official Vice-Regal Dog, or Gavel VRD - and his duties include welcoming tourists to the Government House and taking part in special ceremonies. According to the Governor of Queensland's official Facebook page, Gavel was presented, on April 13, 2016, to the Governor upon his arrival at Government House as a six-week old puppy, then intending to become a Queensland Police Service Dog. He has since then outgrown four ceremonial coats and undergone a career change.